Venus, Mercury and Saturn as seen just before daybreak, wherever you live, in the Eastern sky on Oct. 5. 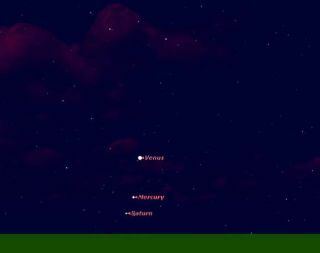 As September comes to a close, the brilliant planet Venus standsas the lone planet visible in the eastern morning sky. But that is going tochange in the coming days. As we transition into October, Venus will soon be joined bytwo other planets, Mercury and Saturn.? During the first half of October, thethree planets will engage each other in some interesting conjunctions and willappear to change position relative to each other on a morning-to-morningbasis.? If you have a clear and unobstructed eastern horizon, you'llbe able to follow this interesting dawn dance of the planets.? Binoculars will help because the combination of their lowaltitudes and bright morning twilight might make the view a bit challenging attimes.? First, we present a viewing synopsis for each planet, followed by achronology of the changing array among the three.? And as a bonus, the moonwill join them on Oct. 16. During the opening week of October should become easilyvisible just above the horizon due east during mid-morning twilight, about 45to 50 minutes before sunrise. For viewers near 40-degrees north latitudeMercury is highest on Oct. 5, its date of greatest elongation (18-degrees westof the sun).? While its other five elongations of 2009 are larger in angle, atthis time of year the ecliptic is nearly vertical in the predawn sky formid-northern observers.? As a result, Mercurystands almost directly above the sun and rises right around the time of thebreak of dawn.? This speedy little planet sinks back toward the sunrise horizonquite slowly for the rest of October, brightening slightly all the while.? Bythe third week of October, Mercury becomes difficult to see; superiorconjunction occurs on Nov. 5. A fun challenge will be to follow it as late intoOctober as possible. Venusrises lustrous in the east just before the first gleam of morning twilightthroughout October. Every week Venus sinks a little lower; in the final days ofOctober binocular viewers may spy the blue star Spica emerging from the dawnglow well below Venus.? Saturnis only now emerging into the morning sky in western Virgo and will startto become visible during the first week of October very low in the east in thebrightening dawn.? The rings were turned edgewise to Earth on Sep. 4 and nowthe northern ring face is beginning to come into view to our line of sight. Ina telescope magnifying at least 30-power, they'll appear as a thin, brightline.? The angle that Saturn's rings are tipped toward Earth increase slightlyduring October from 1.5 to 3-degrees. Oct. 8 ? Early this morning, a very strikingconjunction takes place between Mercury and Saturn. The two planets will beseparated by only three-tenths of a degree.? Mercury will appear almost 5 timesbrighter than Saturn, appearing below and to its right.? And hovering above andto their right will be brilliant Venus. Oct. 13 ? Now it's Venus' turn to have a closeconjunction with Saturn.? They're separated by only a half-degree; Venus willsit below and to Saturn's right and will appear nearly 100 times brighter thanits ringed companion. Oct. 16 ? Facing slightly slightly south of due eastthis morning about an hour before sunrise, you'll see a slender crescent moon,less than 2 days before New, forming a broad isoscelestriangle with Saturn and Venus (the moon at the vertex).